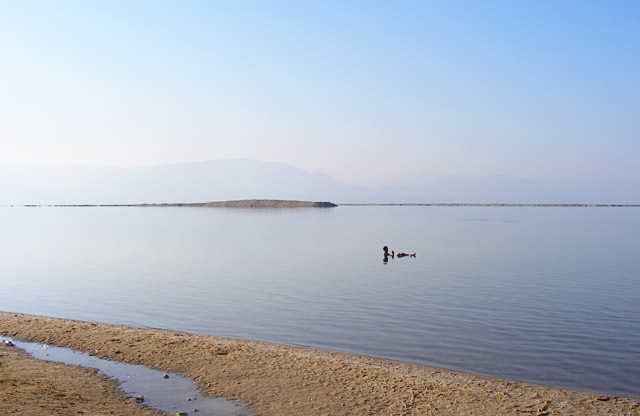 We had heard good things about the Dead Sea, so it was a place we wanted to go. It would have been a really hard day trip, so we planned to stay there overnight. When looking online, we found that there was a place to camp right on the beach, so with Andrew's bag full of pillows, blankets, food and water, we jumped on a bus. We went through Jerusalem a different way than we had before, which took us right up against the wall separating Israel from the West Bank. It was a few hour bus trip that took us through one of the most desolate parts of the world - and it lived up to it. There was nothing once you reached the Dead Sea, it made New Mexico look lush. While we were skirting the Dead Sea towards the major city on the Israel side, we went right past Masada. We had no idea we were even going to be close and hadn't alloted enough time to go there - a regret we still have. When we were finally dropped off in Ein Bokek, we didn't really know where we were going, so we just headed to the beach. 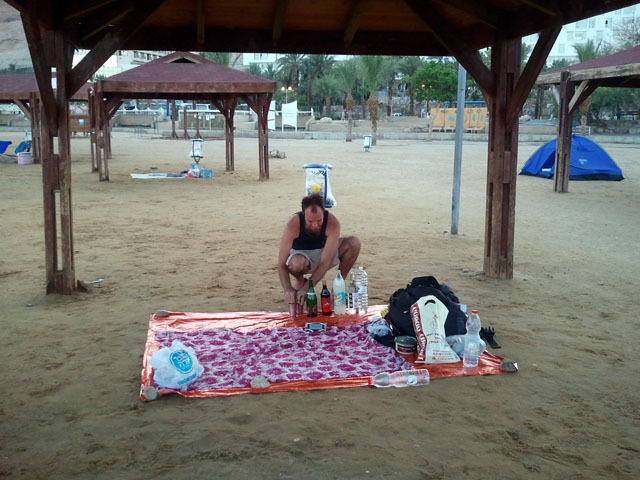 Once we arrived there, we found small covered area with tents set up right on the shores of the Dead Sea. We knew we were in the right place. We claimed an area and stripped down to our swim shorts and got in. It was as buoyant as we heard. You felt like a cork trying to touch the bottom--it would shoot you back up to the surface. And you do not want to get any of that water in your eyes. It's like pouring salt directly into them - not comfortable. While hanging out on the shore, we befriended a gay couple from Moscow. One of the guys was from New York and the other was a native Moscowian. They were really nice and we talked a lot about Russia and what it was like being a gay couple there. We found out that these guys only knew of two gay bars in Moscow and they rotate to keep from being shut down. We'd heard that Dead Sea mud was good for the skin. We thought that we'd just be able to find mud on the Dead Sea shore and cover ourselves in it. But as we found out, the Dead Sea - at least where we were - had no mud. It was just a sandy / salty mix that you would not want to rub all over yourself. 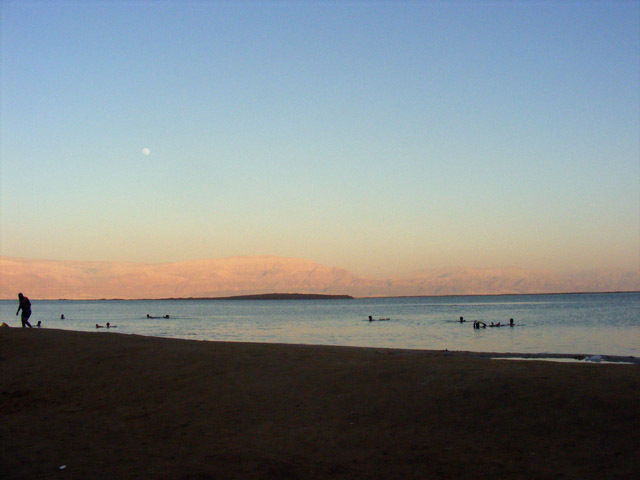 Because of this, we had to go to the mall by the beach and buy packets of Dead Sea mud, while in sight of the Dead Sea. With mud in hand, we head back down to the beach and smeared it all over ourselves. It was definitely not normal mud. It was super greasy and almost clay like. You are supposed to let it dry on you, then take a dip in the water to wash it off. As it's drying you start to feel a little bit like Han Solo getting stuck in Carbonite. Once you get in the water you really have to scrub to get it off to, but when you emerge, your skin feels silky smooth. As the sun began to set over Jordan, we set up our sleeping arrangements, which was a tarp with a blanket and two pillows - so pretty much the Ritz. The plan was the same as it was in Taiwan when we were sleeping in the airport: enough wine and you can sleep anywhere. It was not quite as nice of a night sleep as it had been in the airport in Taiwan. Andrew was attacked by a swarm of biting Dead Sea flies and in the middle of the night, a group of Arab women showed up and went into the Dead Sea, burkas and all. The Arab women then sang songs for many hours while soaking, which means we didn't sleep much. 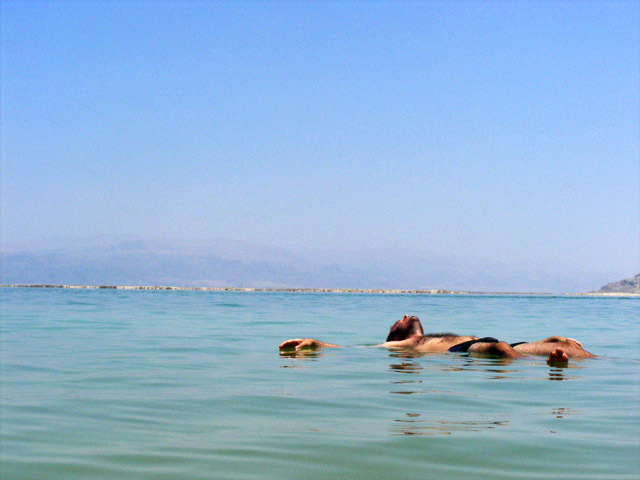 The next morning, we made our coffee and headed right into the Dead Sea for a morning dip. It was so buoyant that we could just sit in it and drink our coffee. I feel like you guys ought to knock karaoke off the list. Seems very accomplishable, and crossing things off lists is sooo satisfying.